All of the herbs used in our herbal gift boxes and Community apothecary shares are ethically wild crafted and/or organically grown by loving herbalists and all formulas are custom blended and witch-crafted by our Apothecary Fairies in the hills of Northwest CT. 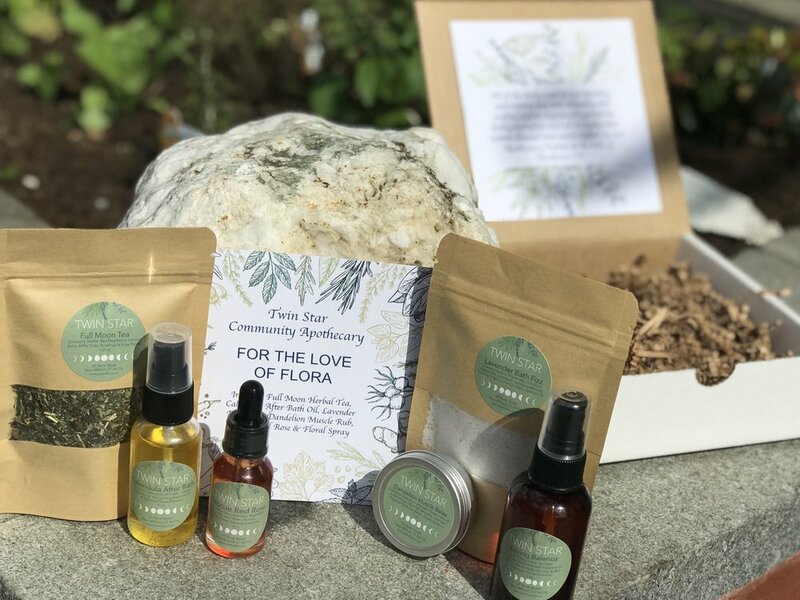 The For the Love of Flora Box Includes: Full Moon Tea, Calendula After Bath, Lavender Bath Fizz, Dandelion Muscle Rub, Rescue Red Rose and Loving Balance Floral Spray. All of the herbs used in our monthly subscription box are ethically wild crafted and/or organically grown by loving herbalists and all formulas are custom blended and witch-crafted by our Apothecary Fairies in the hills of Northwest CT and include in the box you will find a beautifully detailed description of all products. 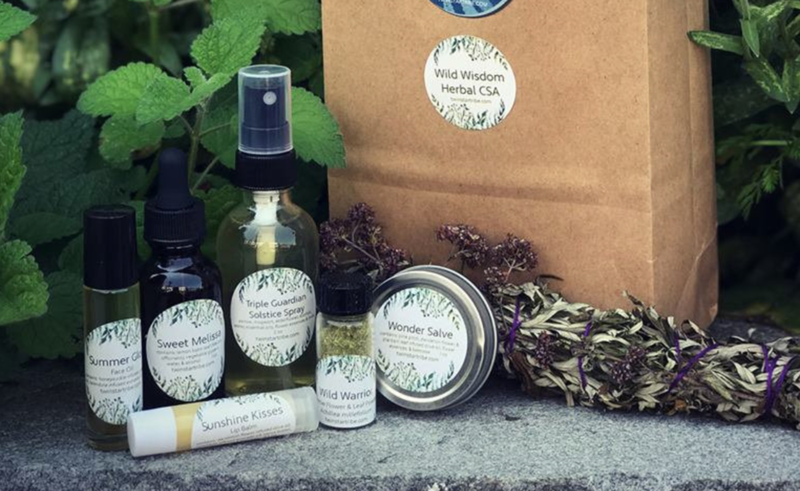 The Summer Of Love Apothecary box includes Summer Lovin Tea, Rose Moon Milk Bath, All Heal Salve, Protect Yo Self Bug Spray, Mugwort Body Oil & mini Mugwort Smudge Stick! All of the herbs used in our monthly subscription box are ethically wild crafted and/or organically grown by loving herbalists and all formulas are custom blended and witch-crafted by our Apothecary Fairies in the hills of Northwest CT and include in the box you will find a beautifully detailed description of all products. 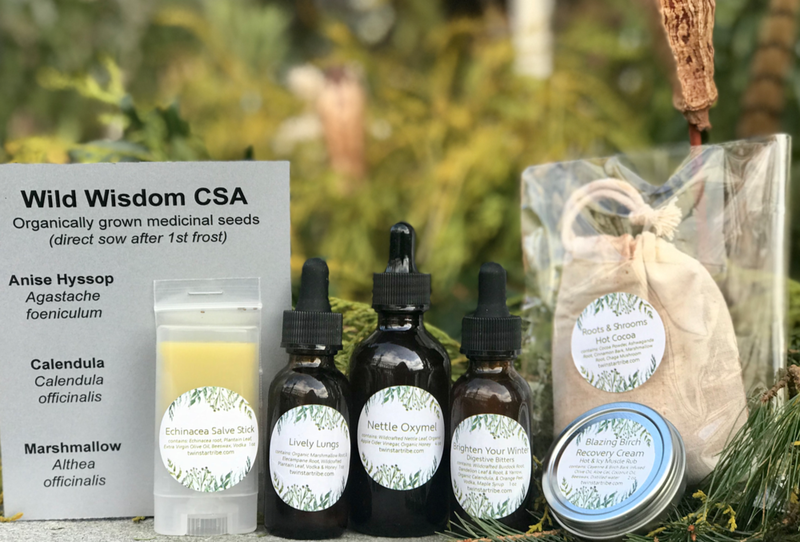 Our Herbal Community Supported Apothecary (CSA) box contains seasonal wildcrafted and/or organically grown herbal remedies, all hand sown, harvested and crafted by Twin Star Students & White Pine Community Farm Members. Our freshly dried medicinal & edible herbs and herbal products are all sourced, wild crafted or organically grown at White Pine Community Farm, Twin Star Gardens and throughout the pristine areas within the Harlem Valley and Litchfield Hills . Hand-made, fresh and effective herbal products made with love, by experienced herbalist, locally for you and your family! - a combination of seasonal herbal products and remedies and freshly dried medicinal and culinary herbs. Sweet Melissa (lemon balm) glycerite, Wild Warrior: yarrow powder, Wonder Salve, Mugwort Smudge Stick, Sunshine Kisses Lip Balm, Triple Guardian Solstice Spray, and Summer Glow Face Oil! All of this comes with a beautifully written newsletter explain the traditional uses of these herbs and a little bit about the products! Autumn Rising Tea, Bee Balm & Goldenrod Honey, Herbal Mouth Wash, Mystical Moon Balm, Sweet Relief, Herbal Glycerite, Flower Power and Immune Boost. All of this comes with a beautifully written newsletter explain the traditional uses of these herbs and a little bit about the products! Blazing Birch, Recovery Cream, Nettle Oxymel, Roots & Shrooms Hot Cocoa, Brighten Your Winter Bitters, Echinacea Salve Stick, Lively Lungs Tincture and Medicinal Seed Packets.All of this comes with a beautifully written newsletter explain the traditional uses of these herbs and a little bit about the products!